Alumni revelers flash their brightest smiles during the end of the motorcade. An exalting and spectacular display of fireworks above the open skies of the university grounds served as a suiting welcome to the homecoming alumni during the 2011 Alumni Grand Fellowship Night held last December 9. The whole of the WMSU community reveled as they witness the enticing show of lights across the night sky, sending them to feel the true sense of Crimson spirit. The theme for this year’s celebration is WMSU Alumni: Partners for Development and Excellence… True Blue, State U. The festivities were jointly headed and planned by the WMSU Alumni Association Inc. (WMSUAAI) and the university Alumni Relations Office. Already on its 92nd year of hoisting proud and successful alumni, this year’s alumni celebration put up last December 5 with the Market-Market na WMSU. The event is being held annually in which food stalls and booths flock the campus, showcasing varieties of fast-foods, RTWS, novelty items, henna tattoo art service and fun games. The Market-Market na WMSU never fails to invite alumni and students alike for bargains and ready refreshments every year during homecoming. Slated on December 8 was the event dubbed as “The Best of WMSU High School Variety Show” at the Dr. Juanito Bruno Gymnasium. Students from the Integrated Laboratory School-High School Department demonstrated their ingenuity in the performing arts. Proud parents and mentors were entertained through numbers of fun songs and dances by the talented students. Following the next day, December 9, a Thanksgiving Mass was also celebrated in honor of the occasion at the Dr. Juanito Bruno Gymnasium. The Alumni Welcome Program and parade and review were held at the open field after the mass. The activities were attended by the different university officials, faculty and staff, alumni and students. This year’s Golden Jubilarians are graduates from the Class 1961, while the Silver Jubilarians belong to the Class of 1986. 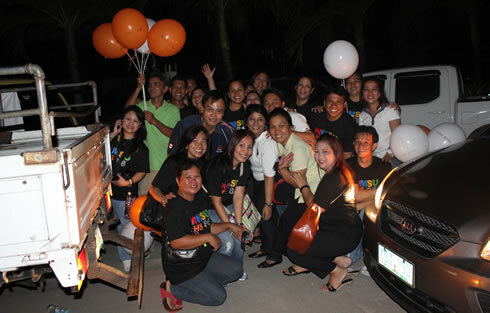 The evening of December 9, marks the 2011 Alumni Grand Fellowship Night, kicking off with a motorcade of the alumni around the city proper. The motorcade culminated at the open field which prompted the start of the evening’s affair. The Fellowship Night was co-headed by the President of the WMSU Alumni Association Inc. (WMSUAAI)/ Alumni Regent, Prof. Mahmor N. Edding; and the university Director of the Alumni Relations Office-Prof. Nerissa M. Mantilla. University President, Dr. Hja. Luningning M. Umar delivered an inspirational message during the significant occasion of the university. She expressed her delight towards the alumni for bringing countless honors and pride to the Alma Mater. Truly, the occasion recognizes that products of the university are partners for development and are living proofs of excellence. The fellowship night served as a venue to recognize outstanding jubilarians, alumni and alumni coordinators. Recipients of the award were given plaque of recognition. Certificates were also presented to the loyalty award recipients. Prof. Edding and Prof. Mantilla took the honor to attribute the awards to the different recipients respectively. The Watchamacallit, a mainstay event of the annual homecoming transpired after the awarding. Watchamacallit is a group contest in which the alumni, faculty of the different colleges and students take turn to perfom onstage. Participating groups conceptualized ways on how to entertain the audience, may it be in a form of dance, song, play-acting or combinations of the three. Winners were proclaimed after the comic but heart-warming performances. December 10 served as a crucial day as the alumni voted during the Election for the Board of Directors of the Western Mindanao Alumni Association Inc.. It is from this election in which the elected Board of Directors wholly elects a new Alumni Regent that will represent the Alumni sector in the Board of Regents of the university. In the lighter side, the event was followed by the TRIPARTITE Affair on the evening, showcasing San Miguel Beer live band to entertain the crowd at the open field.